S’appuyant sur les derniers développements en matière de recherche cézannienne, la réflexion proposée porte sur les instruments et les ressources de la recherche fondamentale en histoire de l’art, avec leurs changements et leurs accélérations. Le potentiel des moyens techniques contemporains et des recherches interdisciplinaires sera notamment exploré, avec la numérisation, la coopération entre la restauration et l’histoire de l’art, l’orientation de l’historiographie et son évolution et le rôle des musées en tant qu’instituts de recherche. Anita Haldemanns Vortrag gibt Einblick in das Forschungs- und Ausstellungsprojekt zu Cézannes 154 Zeichnungen im Kupferstichkabinett des Kunstmuseums Basel, das in der Ausstellung « Der verborgenen Cézanne. Vom Skizzenbuch zur Leinwand » (10.6.–24.9.2017) gipfelte. Von der ersten Sichtung des Materials bis zur Inszenierung der Ausstellung werden alle wichtigen Schritte thematisiert, die das Ausstellungsteam, das aus Kunsthistorikerinnen und Restauratorinnen bestand, unternommen hat. 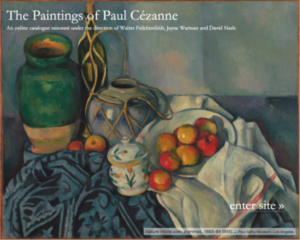 Since the publication of the catalogues raisonnés of Paul Cezanne’s paintings (1936, 1996), watercolors (1983) and drawings (1973), recent scholarship has advanced the study of the artist, the Internet has changed research practices and color photography has replaced black and white. The online catalogue raisonné, under the direction of Walter Feilchenfeldt, David Nash and Jayne Warman, capitalizes on the versatility of modern-day technology and takes Cezanne research in a new direction. 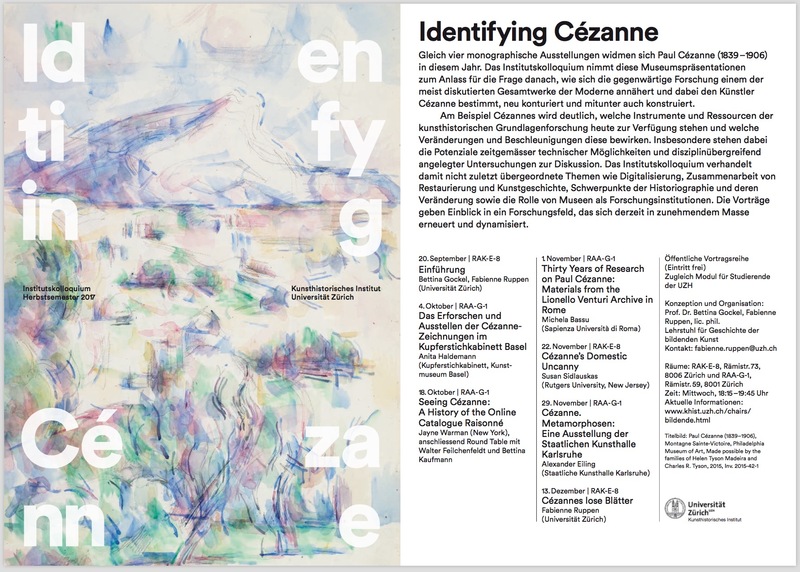 In addition to establishing the authenticity of Cezanne’s pictures the interactive catalogue provides the researcher a means of studying the work of this great artist from many different perspectives. Launched in November 2014, the painting catalogue was the first installment of the artist’s complete works; the artist’s watercolors and drawings will be available online and fully integrated into the existing catalogue in December 2018. Jayne Warman will present a brief history of the Cezanne catalogue raisonné followed by a live demonstration of some of the many features of the online edition and possibilities for the future. The presentation stems from the Ph.D. thesis in Art History titled Cézanne. Son art, son oeuvre: birth of a catalogue raisonné and a critical reception, defended at the Sapienza University of Rome in May 2016. 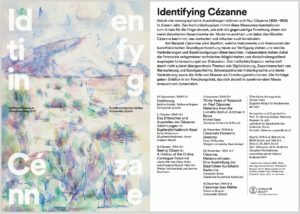 During this session a large number of unpublished documents that form part of the Cézanne Series in the Lionello Venturi Archive (Department of Art History and Performance – Sapienza University of Rome) will be discussed. These materials (site photographs, notes, conference texts, correspondence etc.) were used in the first Cézanne catalogue raisonné published in 1936 (Cézanne. Son art, son oeuvre) and for all other subsequent written works on the painter by the Italian art historian Lionello Venturi (1885–1961), including the second edition of the catalogue raisonné which remained unpublished and was finally to be revised by John Rewald. The aim is to show Venturi’s working methodology, taking into consideration his close relationships with Léo Marchutz (1903–1976), John Rewald (1912–1994), Fritz Novotny (1903–1983), and through this, demonstrating a continuity which links the first Cézanne catalogue raisonné to later editions, especially the most recent online one. There is no modern painter less identified with the domestic than Paul Cézanne. The art historian Linda Nochlin once called him “the lone-wolf master of Aix” and the designation has stuck. But, inconveniently for the lone-wolf myth, Cézanne had a wife and a son, and despite long periods of separation, his sketchbooks indicate that the family members spent a significant amount of time together. I will consider Cézanne’s supposed renunciation of the domestic, and instead explore the way in which he remade it. Often, a Cézanne setting seems simultaneously interior and exterior. At other times, the two seem to meet, in an unstable convergence. The centerpiece of the artist’s ambitious watercolor, The Balcony (c. 1900, Philadelphia Museum of Art), is a fragile-appearing but deceptively elastic screen of color: a perforated wall situated where the formlessness of nature confronts the dwelling with greatest force (or perhaps, in Cézanne’s case it was the reverse—the formless dwelling resisting the architecture of nature). Rather than visualizing an enclosure defined by walls, the painter imagined a kind of membrane between the inside and the outside, suggesting that the boundary between self and world was both “permeable and reversible.” (Paul Connerton) The green and blue strokes of color refuse to stay outside where they belong. The reassurance that others extracted from the familiarity of domestic life was neither possible nor desirable for Cézanne.. His art was forged through his talent—or curse—for being surprised by everything around him. Furniture and clothing often appear to be engaged in an unresolvable contest for dominance. The curving frames of two household chairs are entwined like giant chains, or wrestlers locked in a strangehold. In Jacket on a Chair (1890-92, Private Collection) a cumbersome garment writhes with life. With its fabric mountains and grottoes, it appears entirely capable of crushing the unnervingly springy legs on which it sits. Other objects become worlds unto themselves. An elegant armchair (Courtauld) possesses a restless asymmetry; it is seen frontally from the left, but obliquely from the right—the stranded leg the evidence of another attempt abandoned. Its strong arms enclose a soft mountain of pillows that rises up against a textile sky filled with clouds: the chair is an idealized dwelling-in-miniature, with land and atmosphere in perfect equipoise. The lightly compressed slope of the pillows and the multiple legs also suggest that the chair has become a kind of body, arrogating space and beckoning the viewer with its concave softness. When studies of Hortense and Paul appear in the sketchbooks, there are often unexpected, almost humorous, juxtapositions of household objects and heads or limbs. Hortense angles for space on the page with an obstreperous milk can; her rounded head competes for preeminence with an apple that seems to be rolling up towards her. As she sits sewing, or not sewing, in what appears to be a bedroom, she is barricaded on all sides by the disorderly architecture of domestic life: the leaning tower of books balanced precariously on a night table; the bedpost whose force and geometry outweigh that of her figure. Der Vortrag widmet sich der Entstehung und Konzeption der Ausstellung Cézanne. Metamorphosenan der Staatlichen Kunsthalle Karlsruhe. Cézanne suchte das Geheimnis und das Wesen der ihn umgebenden Welt einzufangen, Phänomene, die sich ihm als stete Metamorphose der sinnlichen Erscheinungen darboten. Er reagierte hochsensibel auf die Veränderungen der ihm umgebenden Natur, die er seismographisch aufnahm und in die Sprache seiner Kunst übertrug. Cézannes Arbeiten verbildlichen einen Prozess des künstlerischen Suchens, der nicht auf Vollendung ausgerichtet ist, sondern seine Motive stetig umkreist. Die Grundidee des Karlsruher Projektes ist es daher, sich Cezannes Kunst unter dem Blickwinkel des Prozesshaften, der steten Wandlungen und Übergänge von einer in die andere Form zu nähern. Im Hintergrund steht die Überzeugung, dass Cézannes Werkphasen und Motive durch eine innere Einheit miteinander verbunden sind, die sich einer starren Kategorisierung widersetzt. Die Ausstellung macht es sich zur Aufgabe, diesen Zusammenhang zu thematisieren. Hierzu wurde die klassisch nach Bildgattungen geordnete Ausstellungspraxis immer wieder durchbrochen, um Wechselwirkungen zwischen den verschiedenen Genres, zwischen Figurenbildern und Stillleben, Stillleben und Landschaften sowie zwischen Landschaften und Porträts aufzuzeigen. Arbeiten auf Papier machen rund Zweidrittel von Cézannes Œuvre aus. Seine knapp 2000 Aquarelle und Zeichnungen stellen die Forschung vor grosse Herausforderungen, sind die ursprünglichen Zusammenhänge doch oftmals nicht mehr ersichtlich. So wurden etwa die Skizzenbücher mehrheitlich aufgelöst, ihre Seiten einzeln verkauft. Gleichsam zerteilte man grossformatige Studienblätter, auf denen Cézanne mehrere Sujets ausführte. Heute liegen deshalb zahlreiche Fragmente vor, deren Herkunft es zu klären gilt. Der Vortrag zeigt am Beispiel Cézannes, welche grundlegenden Einsichten ein detailliertes Studium von Originalen zu liefern vermag. Die Aufmerksamkeit beschränkt sich dabei nicht auf die Darstellungen an sich, vielmehr werden auch Merkmale wie Wasserzeichen, Spuren einer ehemaligen Heftung oder von anderer Hand angebrachte Notizen berücksichtigt. In ihrer Gesamtheit geben solche materiellen Kriterien Aufschluss über die individuelle Biografie eines jeden Originals und gestatten es, den Entstehungskontext wiederherzustellen. Fallstudien veranschaulichen, inwiefern diese Kenntnisse letztlich zu einem vertieften Verständnis des Gesamtwerks beitragen. However, studying these works as three-dimensional objects facilitates the discovery of new connections. Traces such as watermarks, stains or binding stitches allow seemingly independent drawings to emerge as fragments from sketchbook pages or loose sheets. Exemplary case studies demonstrate that a consideration of the original context reveals a deeper understanding of each individual drawing.